From what I’m hearing McKenzie and Allen have all but flatly admitted that they gained almost no knowledge of Raider personnel from watching tape of the team after being hired in 2012. What the two produced last season was almost a complete roll of the dice. While Saunders and Wisniewski were retained with the idea of providing input regarding continuity, apparently both were ignored, leading to the early resignation of Wisniewski and the complete disappearance of Saunders (not to mention one PO’d Mark Davis). One must certainly believe that, this season, the employment of both is on the bubble. So where are we headed this season? I believe that the clearest evidence is to be found in the selection of our new Offensive Coordinator, Greg Olson. Some credit Olson with helping to develop the way the Wildcat formation is currently used in the NFL. Olson spent time working with Jon Gruden, and it is believed that Olson prefers a Gruden style offense. The Gruden offense is a North/South power running game, accompanied by an East/West (West Coast) passing game. But there is a new wrinkle in passing games learned by the entire NFL during the 2012 season. This involves what has become known as the Wildcat, but in reality is a recreation of the ancient Single Wing. The modern twist puts a ball carrier that can sometimes pass in the “Tailback” slot to protect the signal caller from being pummeled down field or between the tackles. A bit of history in football trends is required here. In the “old days,” football teams most commonly ran the Single Wing. This was a run based offense where the Quarterback (then called the Tailback) would run the ball on his own as often as he would throw it, as the forward pass was still relatively new. In professional football that exposed a team’s field general to brutal defenses without the benefit of rules designed to protect the player’s safety. Quarterbacks went down with injuries on a regular basis. In response, teams began designing formations which formed a protective “pocket” around the signal caller in order to keep him in the game. Quarterbacks were less and less likely to run the ball, exposing themselves to injury, unless they could first prove to the coaching staff that they knew how to avoid the hits and get out bounds. Over the years, however, defenses learned to target Quarterbacks in the pocket. Injuries, again, were on the rise. With public demand to reduce injuries on the field, the NFL began to instill rules that would protect the Quarterback (and other ball carriers) whether in the pocket or breaking down field. In the wake of expensive class action law suits, the NFL has instituted every rule committees could think of to protect players’ health and to keep them from being targeted for injury. The result is that Quarterbacks can once again run with the football. The old Quarterback option plays are fully back into play in the NFL and aren’t just for high school and college teams anymore. With the Raiders, every fresh look is now being given to Quarterback Pryor. Pryor is perfect for this retro format in that he can move freely in the backfield and wait for a receiver to open, or he can keep the ball and run for significant yardage. Having shown himself to have a good and accurate arm in college, the questions that surround Pryor are his decision making skills and his sense of passing “touch.” Those questions cannot be answered until the Raiders have taken the field in the 2013 preseason. The Raiders only alternative to Pryor, at the moment, is Carson Palmer, an excellent pocket passer in the old Raiders tradition. However, Palmer may soon be a dinosaur if the new NFL trend comes to complete fruition. The Raiders have discussed the possibility of going into the 2013 season with a package of plays for Pryor and a package for Palmer. The Raiders would not only have two Quarterbacks in competition with each other, they would have two systems in competition with each other. While the concept seems strange, if the Raiders want to pursue the new trend, they have few options. If Pryor doesn’t work out there are no more experienced Quarterbacks with Pryor’s skill set in free agency, and Palmer is far superior to any other pocket passer on the open market. It makes no sense to draft a pocket passer if they are intent on following the modern trend. The only other option is to go “all in” on the modern trend and to spend a high draft pick on a Quarterback with Pryor’s skill set who will have less NFL experience, and far less experience with Raider talent than Pryor. My bet is that the Raiders will indeed begin the preseason heavily relying on a power running game with two different passing systems, run by two different Quarterbacks. Palmer’s contract will be renegotiated with incentives to free up cap room. They will use a latter round draft pick to bring a rookie with a similar skill set to Pryor and get a pocket passer in free agency. If Pryor shows he’s ready, Palmer will be traded or released. I think what will happen is that Pryor will come through. He’s shown himself to be far hungrier than any Quarterback we’ve had here since Rich Gannon. If he does, the Raiders will transition fully to the new offense as the season progresses. If he doesn’t, the Raiders will either be forced to transition back to Palmer or be caught struggling between two systems. In that case, the whole season will rest on McFadden’s injury prone shoulders. Well, I'm back after my annual winter hibernation. I've been faithfully blogging here since the beginning of the 2005 season. In that span, I've yet to witness a winning season. So don't begrudge me a bit of seasonal disengagement. The 2012 season was particularly dispiriting. It was supposed to be different and better. Yet it was more of the same, but also worse. I wouldn't blame Mark Davis if the steam was still coming out of his ears. Carson Palmer. How much would he be worth on the open market right now, if you wanted to trade him? What could you get for him? The answer to that question says a lot about where we stand at the most important position on the field. Jones wrote in the previous take that he saw video of Dennis Allen at the Combine: "Just watched vids with Dennis Allen at the Combine. He came out and admitted they made mistakes. He also said that they really didn't have a clue what they had in the players even after watching film of the season with Hue....basically, it sounded like a clusterf... and they were just trying to get through it as they went. Allen also said his new OC will design the scheme around the talent (McFadden)." Maybe next time they should consult with us. Who could have told you that Knapp was a poor choice? Who could have told you that going away from a proven formula for McFadden would spell disaster? Who could have told you that the roster was weak in talent and thin in character? Basically, all of you at Raider Take. Reggie & Co. broke out the spackle and duct tape last year, and we saw how that went. Now they finally realize that there's some serious remodeling to be done. Let's also hope that they stop fixing what's not broken (see: McFadden scheme 2011). 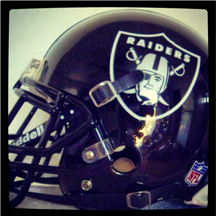 Anyhow, I leave you with this photo of a black Raiders helmet tweeted by Mike Goodson. Don't know the story behind it. The NFL doesn't allow alternate lids, and we know that the silver hat is here to stay, so it's probably just some sort of concept helmet. Intriguing nonetheless. Fire away: what should we expect from the 2013 Raiders? Who will helm the QB position? Are the Geno Smith rumors true? Who's your choice for first-round pick?